Posted by Lacey Hagler on Thursday, October 4th, 2018 at 4:19pm. 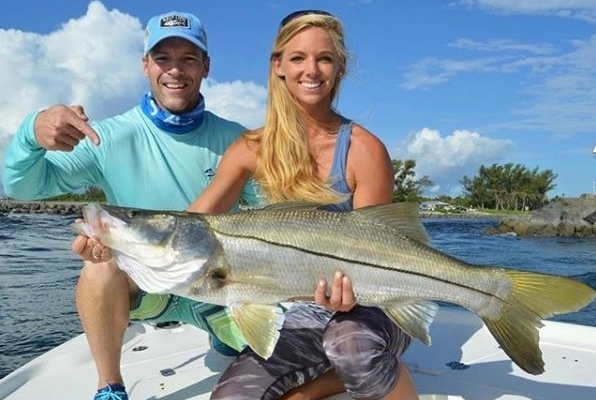 Snook and jacks are being caught in the early mornings or low-lit times of the day at the Juno Pier, Jupiter South Jetty, and inshore. Live mullet can be found during low light periods of the day away from boat traffic, and is usually the best bait for snook, as well as top water plugs. Bottom fishing boats have been catching kingfish and mutton snapper near 120 – 200’ with sardines, and dolphin has been pretty consistent offshore, as well as blackfin tuna in 200-300’ with small-skirted bonita strips. This weekend, the 10th Annual Bluewater Babes Fish For a Cure Tournament will be going in full force, so don’t be alarmed if you see boats decked out in pink decorations and festive bikini-clad anglers. These female anglers are fishing for a cause- to raise money for local breast and ovarian cancer patients. The event fishes out of Sailfish Marina, and fishing takes place on Saturday, but the 21-and-up party starts Friday night on the docks. Stop by to admire the elaborate costumes and cocktails made by these fierce fishing females. Friday, 10/5: Mostly Sunny, High of 88 degrees, East winds at 10-15 knots, 2-4’ seas, occasional 5’ at 5 second periods, Intracoastal waters a moderate chop. Saturday, 10/6: Mostly Sunny with a 20% chance of thunderstorms, High of 87 degrees, East winds at 10-15 knots, 2-4’ seas, occasional 5’ at 5 second periods, Intracoastal waters a moderate chop. Sunday, 10/7: Mostly Sunny with a 30% chance of thunderstorms, High of 88 degrees, East winds at 15-20 knots, seas 3-5’, occasional 6’ at 5 second periods, Intracoastal waters choppy. As usual, have a safe, fun weekend on the South Florida water, and send any good pictures or stories to Lacey@wfpcc.com for a chance to be featured!